You are here: Home / Blog / Counseling / Normal? What’s that? According to my Word Thesaurus, synonyms for the word normal include usual, regular, standard, ordinary, typical, customary, common, and average. I don’t think any of those words describe me, and I am glad. Who would want to be typical or average? I want to be unique and individual. It is counterintuitive, because if we are not normal, we must be abnormal, that means we’re odd or strange. I don’t really want to be that either. Who determines what is normal. Do researchers stand on street corners and compare the looks and behavior of the people they see? Do teachers chart their students on the graph; ten for normal, and one for abnormal? No, of course they don’t. Normal distribution is merely a numbers game. I’ve always been an advocate for the normal curve because the range for normal is quite large, and that is where most of us fall in the normal range whether it height, weight, grades, language skills, etc. 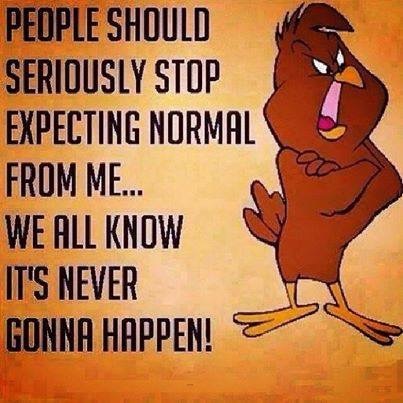 I guess I AM normal but I’m certainly not in the center of the bell curve. I am way off to one side – nearing the bottom of the curve – the horizontal lines indicating abnormal. I am happy about that. Don’t get me wrong, I see nothing innately wrong with a person that is near perfectly normal. I only believe that it is more abnormal than abnormal. I spent many years trying to be like the normal person at the center of the curve; always grades of A+ – never making mistakes – always looking like a magazine cover. I gave that up because 1) it was too much work, 2) it was no fun, and 3) it is not who I was or am. Perfect isn’t possible and never the goal. Most of us hit the normal range without trying, so be who you are, think how you think, dress like you dress, and speak with a strong voice so people like you for who you are. It is no good being loved if you are loved for the person you pretend to be. 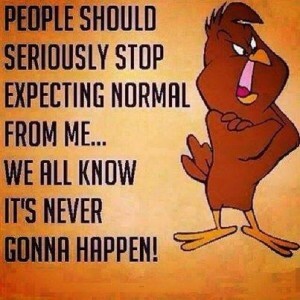 Give normal no credence!